Jesús Galvan is one of this year’s Residence Life Fellows. Jesús is originally from northern Illinois (not quite Chicago) and recently received his Bachelor’s in Kinesiology from the University of Wisconsin-Madison. He also got certificates/minors in Chican@ & Latin@ Studies and Global Health. 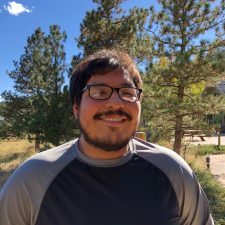 Throughout his five years at UW-Madison, Jesús was in several campus involvement and leadership activities which ranged from being a student representative for the School of Education to being an Undergraduate Teaching Fellow, Writing Fellow, and House Fellow across various campus departments. He is excited to share his passion for cross-cultural mentorship and youth empowerment, as he hopes to integrate these practices into his future work as a school counselor for high schoolers. This past summer, Jesús spent 2 months in Guayaquil, Ecuador as an English Teacher for El Centro Ecuatoriano Norteamericano (CEN). Some of his interests include biking, Zumba, going to concerts, writing creatively, and making memes. Students inspire me when they attain a vision for themselves.